The Society of Collision Repair Specialists (SCRS) has published the full schedule and lineup of speakers for the inaugural OEM Collision Repair Technology Summit being held Wednesday, November 5th at the Las Vegas Convention Center during the SEMA Show. The Summit will allow the industry to explore ways in which automotive design, technology and materials impact repairability, and how in turn how repairability influences structural design and development. Registration is required, and can be selected as a stand-alone event or as part of the RDE Full Series Pass. Event is held in the upper level of the Las Vegas Convention Center, North Hall in Rooms N231-N241. Register today at www.semashow.com/scrs. To print schedule, click here. A panel of automakers and their designated certifying partner companies will discuss the development and implementation of OEM certification programs. The sessions will discuss what they look for, the advantages such programs create for the marketplace, and how the programs are changing the future outlook for the industry. The OEM Collision Repair Technology Summit is produced by the Society of Collision Repair Specialists and supported by PPG Refinish Products; AudaExplore, a Solera Company; BASF; Ford Motor Co.; The Hertz Corporation; 3M Automotive; CrashRepairInfo.com and Toyota Motor Sales, USA. 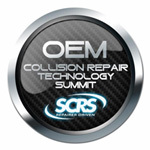 For more information about SCRS’ Repairer Driven Education (RDE) series, and to register for the OEM Collision Repair Technology Summit and other RDE sessions, please visit www.semashow.com/scrs. Discounted pricing available through Friday, October 17, 2014. About SEMA and the SEMA Show: The SEMA Show is a trade show produced by the Specialty Equipment Market Association (SEMA), a nonprofit trade association founded in 1963. Since the first SEMA Show debuted in 1967, the annual event has served as the leading venue bringing together manufacturers and buyers within the automotive specialty equipment industry. Products featured at the SEMA Show include those that enhance the styling, functionality, comfort, convenience and safety of cars and trucks. Additional details available at www.semashow.com or www.sema.org, (909) 396-0289. About SCRS’ RDE Series: REPAIRER DRIVEN EDUCATION (RDE) series will feature 4 days of seminar offerings, many of which are uniquely designed and being offered only at the 2014 SEMA Show. Each of the courses has been individually selected or crafted by SCRS because the content specifically focuses on information that is relevant to the diverse array of marketplace perspectives within the collision repair industry. Register atwww.semashow.com/scrs.